Euthanasia Prevention Coalition Euthanasia Prevention Coalition: Canadian study proves that the "suicide contagion" effect exists. Canadian study proves that the "suicide contagion" effect exists. A study published in the Canadian Medical Association Journal in the May 21, 2013 issue proves the theory that exposure to suicide leads to a "suicide contagion" effect. The study titled: Association between exposure to suicide and suicidality outcomes in youth, was authored by Sonja A. Swanson from the Harvard School of Public Health and Ian Coleman from the University of Ottawa School of Public Health. The study assessed the association between exposure to suicide and suicidal thoughts and suicide attempts among young people based on a cross-sectional and prospective two year follow-up study done between 1998 and 2007. The study examined the responses from 8766 children aged 12 - 17 years. 1. The respondents were asked whether anyone in their school had died by suicide (schoolmate's suicide) and they were also asked if they personally knew someone who died by suicide (personally known suicide)? 2. Respondents were asked if they had seriously considered attempting suicide in the past year? If they answered yes, they were asked to report the number of suicide attempts in the past year? The study assessed whether personally knowing a peer decedent increased the risk of suicidality outcomes relative to a lesser-known peer decedent. The study found that aged 16-17, 24.1% of the respondents reported a schoolmate's suicide and 20.1% reported personally knowing someone who died by suicide. (a) Risk of suicidal ideation and attempted suicide if the person was exposed to a suicide. Ages 12-13: 15.3% of those exposed to suicide in the past year had suicidal ideation and 7.5% had attempted suicide, while 3.4% of those unexposed to suicide had suicidal ideation and 1.7% attempted it. Ages 14-15: 14.2% of those exposed to suicide in the past year had suicidal ideation and 8.6% had attempted suicide, while 5.3% of those unexposed to suicide had suicidal ideation and 2.3% attempted it. (b) Risk of suicidal ideation and attempted suicide if the person personally know the person who died by suicide. Ages 12-13: 13.7% had suicidal ideation and 5.6 % had attempted suicide, if they personally knew a person who died by suicide, while 4.6% had suicidal ideation and 2.3% had attempted suicide if they did not personally know a person who died by suicide. Ages 14-15: 18.4% had suicidal ideation and 12.5% had attempted suicide, if they personally knew a person who died by suicide, while 7.6% had suicidal ideation and 3.6% had attempted suicide if they did not personally know a person who died by suicide. Ages 16-17: 14% had suicidal ideation and 8.4% had attempted suicide, if they personally knew a person who died by suicide, while 8.1% had suicidal ideation and 3.2% had attempted suicide if they did not personally know a person who died by suicide. The study found that personally knowing someone who died by suicide presented a marginally greater risk of suicidal ideation or attempted suicide in relation to exposure to suicide alone. "We found that exposure to suicide predicts suicidality. This is true for all age groups, although exposure to suicide increased the risk most dramatically in the youngest age group, when the baseline suicidality was relatively low. ... Exposure was consistently associated with attempts and to a lesser degree ideation; some of these associations were still significant 2 years later." Exposure to suicide is not uncommon. The study indicated that 9% of the 16-17 age group reported that a schoolmate had died by suicide in the past year and 15% reported that a schoolmate had died by suicide more than a year earlier. Since the study found that personally knowing a schoolmate who died by suicide was only of marginal greater risk for suicidal ideation or attempted suicide as compared to exposure to suicide alone therefore the study emphasized the importance of suicide prevention strategies being implemented within a whole school rather than focus on the friends of the person who died by suicide. "2009 Statistics Canada figures show 227 Canadians aged 10 to 19 died by their own hands, with 202 of those cases were among 15 to 19-years-olds. But as the second leading cause of death after accidental injury among Canadian youth, it’s an issue that needs to be taken seriously." Exposure to suicide within the last 2 years was associated with suicidal thoughts and suicide attempts among Canadian youths. This finding is based on responses from 8766 children aged 12–17 years in a national survey carried out between 1998 and 2007. The findings support school-wide or community-wide interventions over targeted strategies following a suicide, say the authors. The Euthanasia Prevention Coalition (EPC) is concerned with the connection between suicide and assisted suicide. This study did not examine the effect of access to suicide devices or weapons related to suicide attempts. This study also did not examine the effect of suicide exposure related to how the media reports a suicide death. Considering the fact that exposure to a suicide death when the person is a similar age and part of the same community is related to a significant increased risk for suicidal ideation and suicide attempts it is likely that how the media reports suicide deaths also increases the risk for suicidal ideation and suicide attempts especially when the person who dies by suicide is a similar age. The World Health Organization published a set of guidelines to prevent suicide. One of the best practices include the media, when reporting about suicide, should at offer a links to suicide prevention resources. A great suicide prevention resource is the group Your Life Counts. The EPC urges researchers to do a study on the relationship between suicide, assisted suicide and the promotion or normalizing of assisted suicide upon the rate of suicide. In the state of Oregon, where assisted suicide has been legal since 1998, the suicide rate has been steadily climbing. The suicide rate in Oregon is now 49% higher than the national average. Hi Alex! With my disability and depression the internet is my lifeline to the outside world but in the past year everywhere I go all I hear is pro assisted suicide crap and people saying if they had to live like that they would surely rather be dead, "who wants to live in diapers?" I have witnessed Canadians mourn the loss of a teen who committed suicide and applaud an elderly women who did the same. It is really hard to block out the message that I am less worthy and better off dead when news reports, blogs, friends even doctors are supporting my death and openly encouraging it. There have been times over the past year where I have considered suicide. My best friend and caregiver recently tried to kill herself, she bought books from the pro euthanasia groups, helium and eventually jumped in front of train. 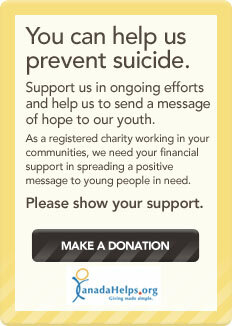 This promotion of suicide needs to stop, it is effecting people, it is destroying hope and it is destroying lives. I am glad that you are alive. The pressure to die that is put on people with disabilities is disturbing. I am happy to stand up for your right to live.